New chef does great job to improve the situation. This property should go green to improve its image, and have a skilled fb manager. The location is amazing- a true retreat. 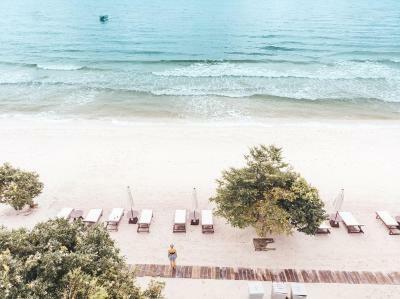 Very clean resort. 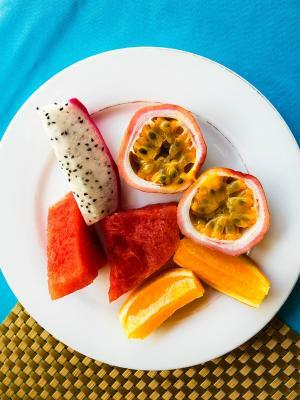 Great food, good breakfasts and proximity to other restaurants also good. Staff were very welcoming and helpful. The snorkeling trip was good but sadly not much to see - reef is destroyed. 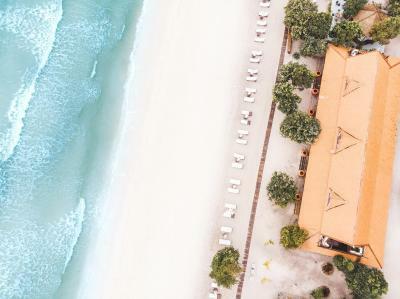 Well organized resort. All staff are friendly and helpful. 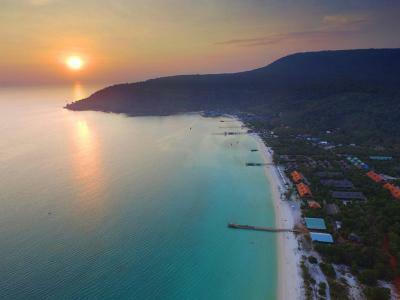 Best shore with beautiful sea view. Sun rising and sun set, wonderful creation by God! The water is always warm suitable for swimming anytime. 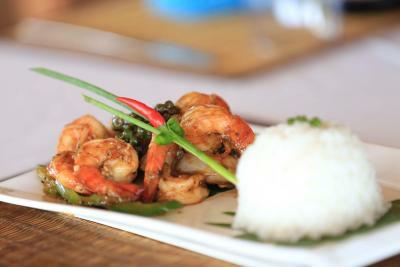 The food is nice and they provides some happy hours for good discount in drinking and BBQ. Good choice for having family hours here! Chalet with garden view Lovely chalets. 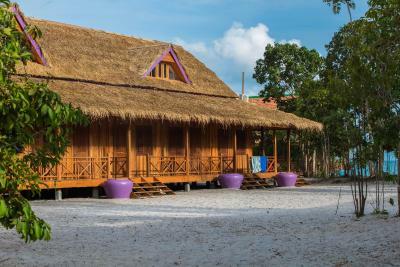 Designed as traditional Cambodian wooden houses. 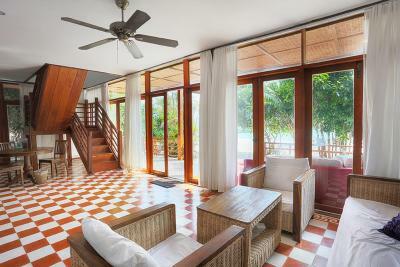 High ceilings, airy, spacious, no need for a/c - the ceiling fans were enough. The standard garden- and seafront rooms are smaller. Very clean and well maintained. Special thanks for the positive environmental impact and recycling. 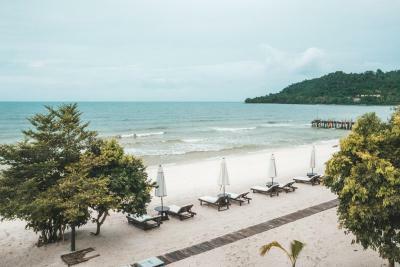 I wish that the housekeeping staff would obey these resort’s house rules as well: towels were changed every day even if I left them on the rack and not on the floor. And special thanks to Mr Cheann, the head of reception for great and professional services in excellent English. The only good thing about this place is the beach, which is truly beautiful. Whilst difficult to get to - it is well worth it! We (three generations - grand parents, parents & kids) had a wonderful stay. 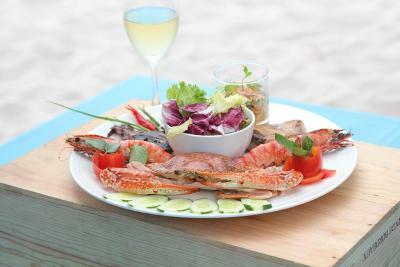 The beach is beautiful and food reasonable given the location. We had a really lovely, relaxed time. Thanks for having us! Everything was amazing and worth every penny! 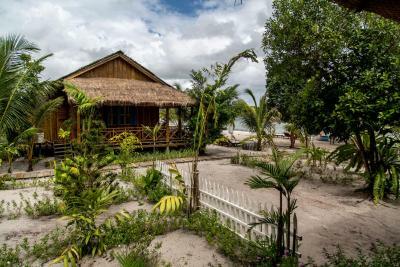 From the ocean front bungalows to the sunset and sunrise. Beach was clean and breath taking! We didn’t know there was a boat that takes you directly to the resort, which, is $40 RT. So we took the GTVC speed boat for $27 RT and walked (10 min walk) to the resort. But there are mopeds you can rent to get you there in 5. 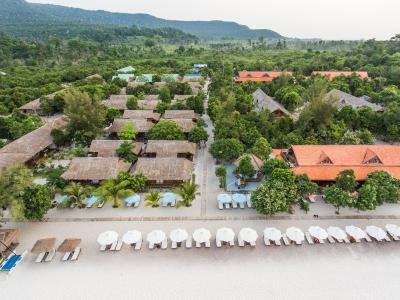 Sok San Beach Resort This rating is a reflection of how the property compares to the industry standard when it comes to price, facilities and services available. It's based on a self-evaluation by the property. Use this rating to help choose your stay! 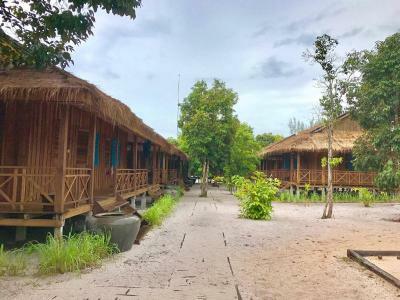 One of our top picks in Koh Rong Island.Offering access to a white sandy beach, Sok San Beach Resort features wooden bungalows with a thatched roof and free WiFi. 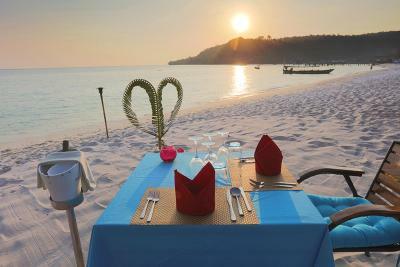 The resort has an open-air lounge, a restaurant and a bar, all facing the sea. 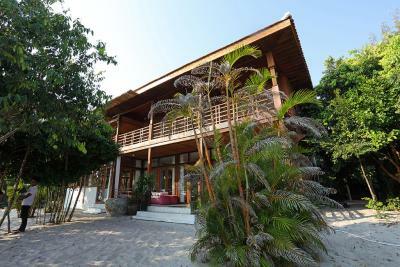 Each accommodations is fitted with a private balcony and a private bathroom with shower facilities and toiletries. 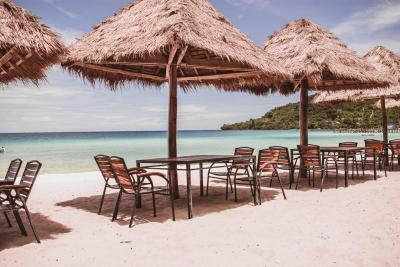 At Sok San Beach Resort you will find a shared lounge area. 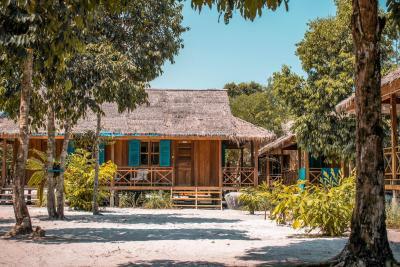 During their stay, guests can go cycling, or enjoy activities such as fishing or cooking. Massage services are also available. 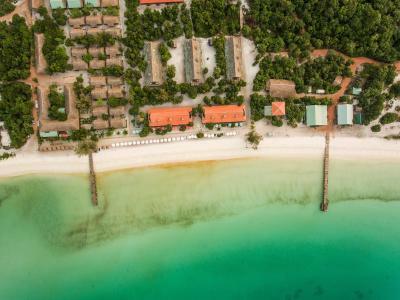 Located on Koh Rong Island, Sok San Beach Resort is 29 mi from Sihanoukville International Airport. Airport shuttle and boat transfer services can be arranged at an additional charge upon request. 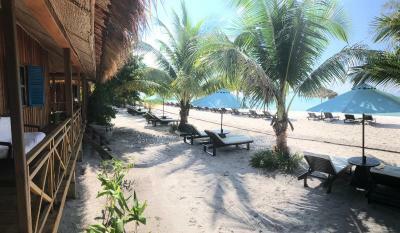 When would you like to stay at Sok San Beach Resort? 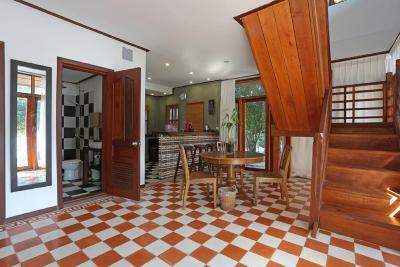 This chalet features 2 connecting rooms with their own private entrance and a shared terrace. 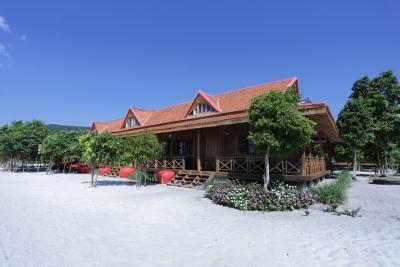 The chalet has one king size bed for 2 people, one living room and includes breakfast for two people. The room capacity can accommodate up to 3 people with an extra single bed at a surcharge, including breakfast (see Policies). A baby cot is available upon request and is free-of-charge. This chalet is fitted with 1 king-sized bed, a living room and is inclusive for breakfast for 2 guests. This air-conditioned family chalet also has a fan option. It features a private balcony that opens up to garden views. The seating area is fitted with a desk. The private bathroom includes shower facilities and free toiletries. 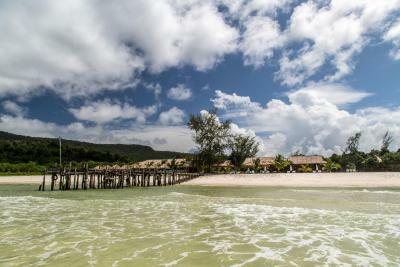 Sok San Beach Resort is located on a 7-km beach of white sand and turquoise water, away from the main touristic spot. 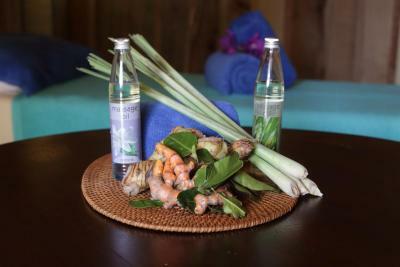 We try to preserve the environment at maximum so all our accommodations blend nature, comfort and tradition. 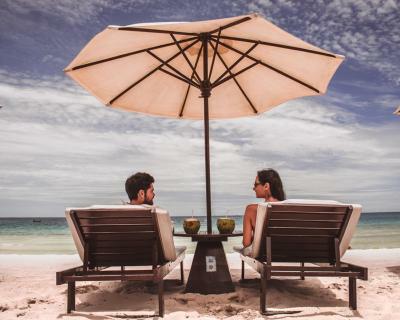 House Rules Sok San Beach Resort takes special requests – add in the next step! 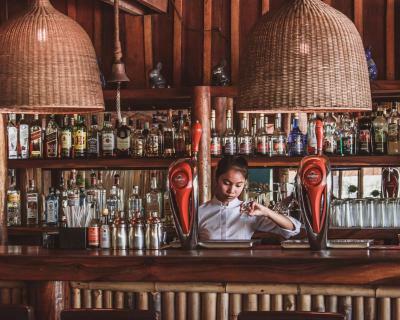 Sok San Beach Resort accepts these cards and reserves the right to temporarily hold an amount prior to arrival. 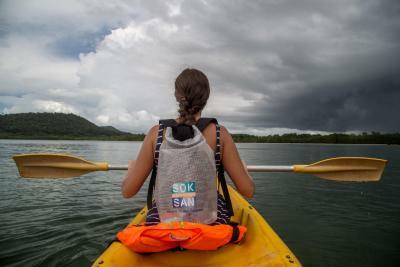 Please note that Sok San Beach Resort is accessible via the property’s private speed boat only. 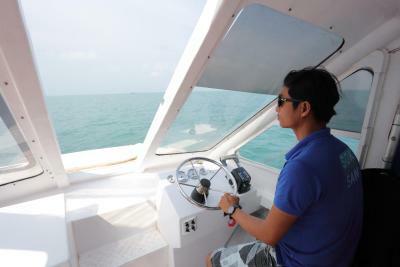 Private speed boat and airport shuttle transfers are available upon request at additional charges. Guests are kindly requested to present at least 30 minutes before the scheduled departure time. 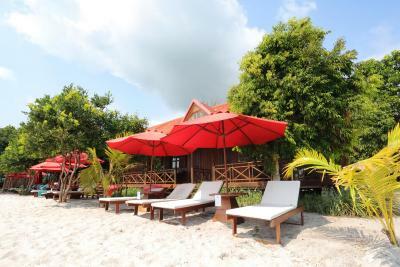 - From Sihanoukville to Sok San Beach Resort: 09:30 / 14:00 / 16:30 hrs. 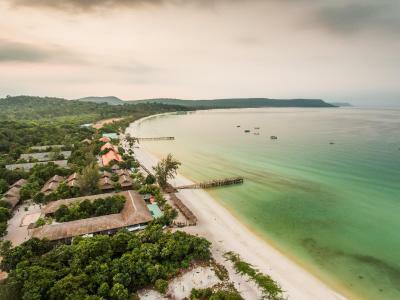 - From Sok San Beach Resort to Sihanoukville: 07:30 / 11:00 / 15:00 hrs. Note that the schedule is subject to change under certain circumstances. To ensure available seat on the day of your arrival, it is highly recommended to book in advance. 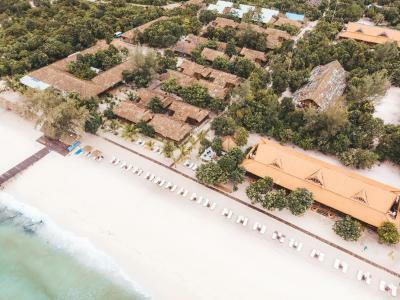 This property also offers chargeable one-way transfer services by a taxi or a minivan to the city’s main locations such as Sihanouk Airport and Sihanoukville (Subject to availability). 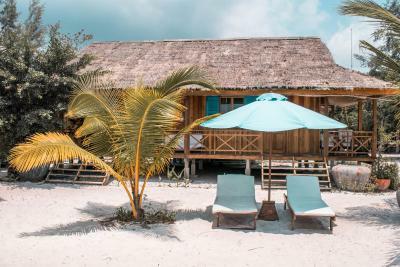 The staff was capable and always smiling, the chalet we stayed at was clean and comfortable. Overall, the resort was AMAZING! The location was superb, and staff went above and beyond to make sure we were looked after. I would highly recommend. Waste management is a major issue in the island. Transportation expenses too high, it doubles flight expenses. Food and beverage not really efficient, with poor quality. Water pots to clean your feet before entering your room is really filthy. Should put smaller pots in order to change it during dry season. No bed side lamp. The beach is incredible The property does an excellent job up early every morning cleaning bags and bags of rubbish off the beach. Beachfront room awesome with great AC and good WiFi. Lovely French girl managing the desk. Very polite Very efficient. Smooth check-in in two steps. Decent food. Great Wi-Fi connection. The water was awesome. Really nice people trying hard to help. Unfortunately too much garbage comes to the shore in the morning. Everything was perfect! Amazing place! 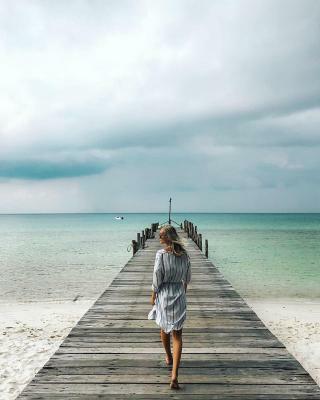 Wonderful beach! 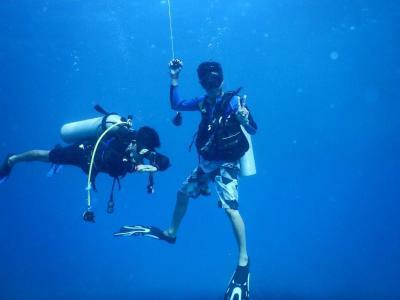 Snorkelling tour had 2 quick stops, would have been nice to see atleast one more. Staff were very friendly and welcoming. Beautiful location. 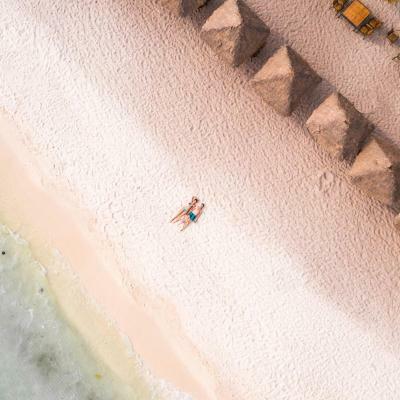 The perfect spot if you are looking to do a whole lot of relaxing. 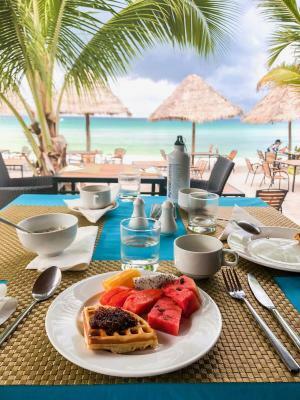 the beach is beautiful..food is ok. breakfast is ridiculous..staff is lazy to refill but they close the buffet in time.. 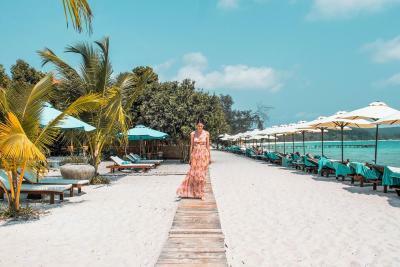 The best thing about this resort is the beach itself which is one of the best I've visited so far in South East Asia. The room was very comfortable and fresh. Restaurant was good and service outstanding. There's any negative thing to say about this place. Highly recommended!